One of the main purposes of jewellery in ancient Egypt was as amulets and charms designed to protect the wearer from mysterious and hostile forces. The finest jewellery was worn only by the king and the royal family, the court and temple priests. The court and temples were therefore the main employers of goldsmiths and most of the gold that was produced was held in the king’s treasury. 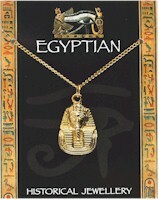 The Tutankhamun Pendant is made from gold plated lead-free pewter and is supplied on a gold plated chain. The fold-over information card is full colour and has historical information on the reverse. Wallet type packaging with reproduction Denarius of Mark Antony held in a blister on the front. On the inside and reverse there is information about Antony & Cleopatra. This coin pack has a reproduction Aureus of each of the first 12 Caesars. The coins are held in clear blisters and mounted on a colour card. The reverse of the pack explains about the 12 Caesars. An A3 size poster showing the Roman Emperors from Augustus in 27BC through to Romulus Augustus in 475AD. A reproduction gold doubloon mounted on a card in a clear blister. The card describes the coin and also information about pirates. A pewter Tutankhamun mask supplied on a quality key chain. An A3 size poster showing the coinage of the Kings and Queens of England from Alfred through to Elizabeth II.